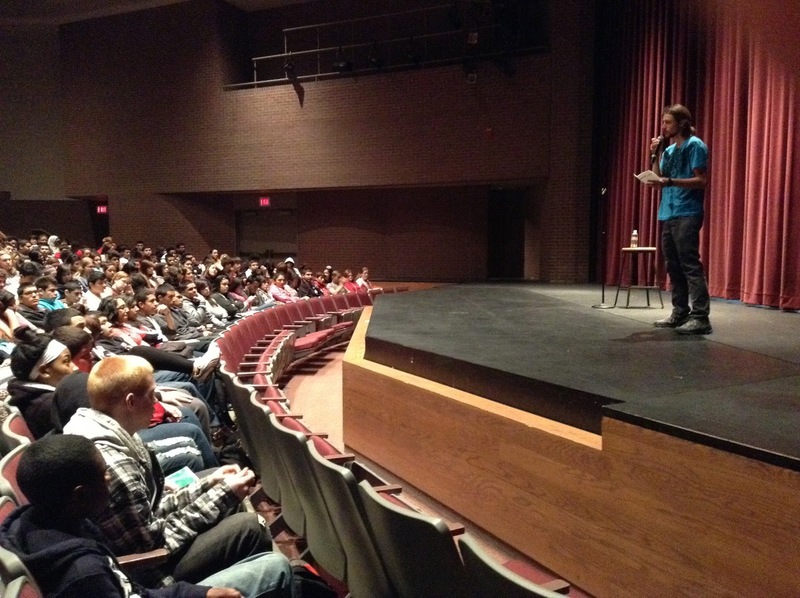 There were nine school assemblies at Omaha South High on Tuesday, April 16. And at each of SEVEN of those nine assemblies, several hundred students were privileged to hear our Cru High National Director, Darryl Smith, share his talk on "making right choices". Since the school was having a day of testing and needed an assembly speaker each hour for the students who were not in a test - Darryl was given the honor and challenge of speaking all day long, except for a lunch break! This seven-assembly speaking marathon came about as a result of one of our Cru South students, Allen, who attended our Cru FastBreak Conference in Minnesota in December 2011. He was impacted by Darryl's influence at FastBreak, and took the initiative to invite Darryl to come speak to his friends and peers at South High. Little did we know at that point that Darryl would be willing and able to come to Omaha to speak at SEVEN assemblies at South High instead of the usual one assembly. We thank God for this amazing opportunity - and we also thank God for giving Darryl the energy and strength needed! 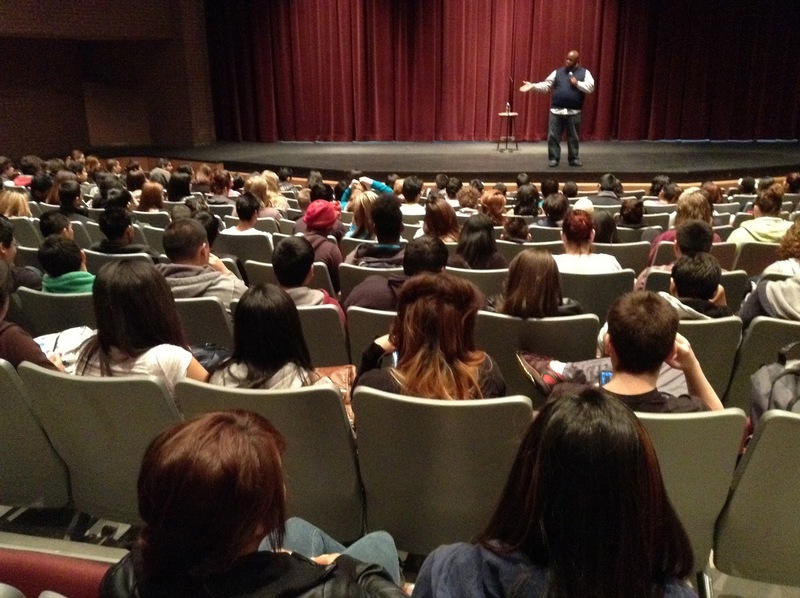 Darryl connected deeply with the students, and after each assembly, he invited the students to come back for an after-school pizza party. Where he would share the biggest right choice that he made in his life: to love and follow Jesus. The students were drawn into his story of how his wrong choices as a teen and young adult ended up in prison time. And how it was there that he made the most important choice of all - to respond to Jesus. Of the one hundred students who came to hear Darryl share of Jesus, nearly one fourth of them communicated to us on the comment cards that they wanted to make the same choice that Darryl had made. Please pray for these students, and for all the others who heard him throughout the day. And please pray for the South High teachers and staff who volunteer with us, as they follow-up with the twenty-five students, and with other interested students. And would you thank God, together with us as staff and volunteers, for His Spirit at work in the lives of students in Omaha and surrounding areas. And for the privilege we had recently of having Darryl in several of our schools. We could not resist having Darryl Smith (our Cru High National Director) speak to our students in Blair and Fort Calhoun, too, when he came to do assemblies at a few Omaha schools. So Monday evening, April 15, found him at the Blair YMCA with a combined group of Cru students from both Blair and Fort Calhoun. These students were in for a heartfelt challenge from Darryl - to take it seriously to be lights on their campuses. Taking seriously the mission of Cru High - WINNING, BUILDING, and SENDING. The students were impacted as Darryl shared from God's Word - challenging them with the unique opportunity they have to make a difference on their campuses. Please pray for the students who were impacted in significant ways from Darryl's challenge. There were some good conversations afterwards, students sharing with each other or with some of our staff team. When life throws some roadblocks in the way of high school graduation, there is still a way. And Accelere Alternative, a unique Omaha school for 17-21 year olds, is one of those ways at a second chance to gain a high school diploma. On Monday, April 15, the one hundred students at Accelere had the opportunity to hear from Darryl Smith, our Cru High National Director, as he shared in a school assembly about making right choices. Sharing authentically from his own life. After the assembly, about fifty of those one hundred students made the choice to join us for a free pizza lunch at the Boys and Girls Club building next door, to hear more. Over their noon break from classes, these fifty students heard Darryl share of his choices as a teen and as a young adult, growing up in the inner city, of selling drugs, of landing in jail. And it was there that he made the most important choice of his life - to accept God's Love for him, and to surrender his life to God, for His purposes. Darryl's story connected deeply with these students. A few of them had shared with him between the assembly and the pizza lunch - that they are empty, looking for something that is missing. Some in desperate situations, some of them parents already, at the same time as finishing up their high school. And some responded, wanting to know more about this Love that Darryl talked about ... and many took a step in opening their hearts to Jesus. We praise God for open doors. For Accelere opening it's doors for us to hold Cru meetings with students over their lunch hour one day each week. For the open door to have Darryl come in for an assembly this week. And most of all, for His Spirit at work in students' lives, and for open hearts to His Love. Please pray for these students. Many of the students have huge burdens in their lives. Pray for those who are open to listen, to hear, and to follow Jesus. The One who can give meaning and purpose. And please pray for those who are blinded and cannot see or listen. PLEASE PRAY - TUESDAY, April 16, AT OMAHA SOUTH! God has opened up a unique opportunity for students at Omaha South. Our Cru High National Director, Darryl Smith, will be with us from Orlando, and will be sharing with students throughout the school hours, and also after school at Omaha South. Listen to Darryl's amazing story. he experienced a radical turn around. helping young adults make good choices in their lives. We praise God for this unique opportunity, and ask for your prayers for many students at Omaha South to come to know Jesus, just as Darryl did in his young adult years. Every Thursday noon some of the students at Accelere Alternative walk a short distance from their campus in the Blackburn High building to the Boys and Girls Club building across the parking lot. They come from a wide variety of backgrounds, and all are students who have returned to finish high school as 17-21 year olds. They come to the Cru Accelere meeting for free pizza, and for a chance to hear about how they can have a personal relationship with God. One of our volunteers with Cru Omaha, Ron Smith, is leading the meeting in the photo above. We are so grateful for Ron. He is involved with Abide Ministries, and has offered of his time to pour his life and heart into the students at Accelere. The students love him, and he has a way of communicating with them on their level. Last week Gary led the meeting in Ron's absence, and the thirty students present that day gave their whole attention as he shared from his life - how knowing Jesus can make all the difference, and how God is present with us through all that life brings our way. There were a few students who came for the very first time. We are amazed at this opportunity God has opened up for Cru meetings during their lunch break. Accelere students will have a special lunch opportunity this next Monday. 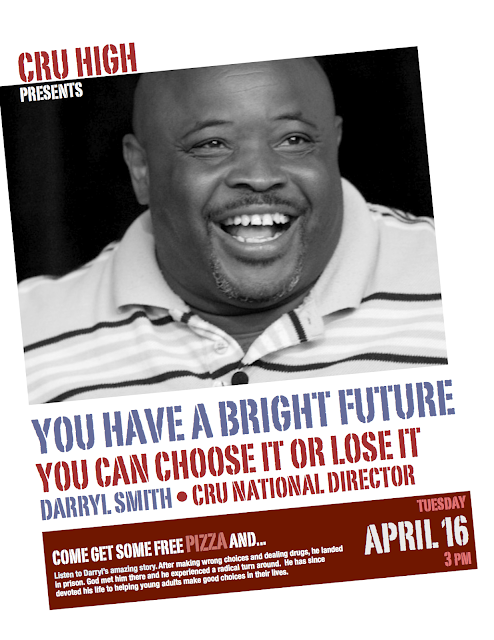 Our Cru National Director, Darryl Smith, will be with us from Orlando, and will be sharing his talk on making right choices, and emphasizing the best right choice a young adult can make: that is, to respond to Jesus and follow Him. Darryl comes from a background of wrong choices as a young adult, which led to some time in prison. Which is where he met Jesus, forever changing his life. Darryl will surely connect with these students.